This post is kindly brought to you by NOW Solutions, who compensated me for this sponsored post. All product descriptions, tips and opinions are my own! When it comes to keeping your skin clear and beautiful, your favorite topical products can only go so far. My 30-something skin is prone to lifestyle, stress- and diet-triggered acne. The best of the best lotions and potions stand zero chance against monster breakouts and rashes if I’m not actively pursuing sweat, relaxation and proper nourishment. Supplements have been part of my overall health plan, under the guidance of my Western doctors and naturopath, for several years. Many of the supplements I take do triple duty, supporting my health, guts and skin. They are all connected, folks! 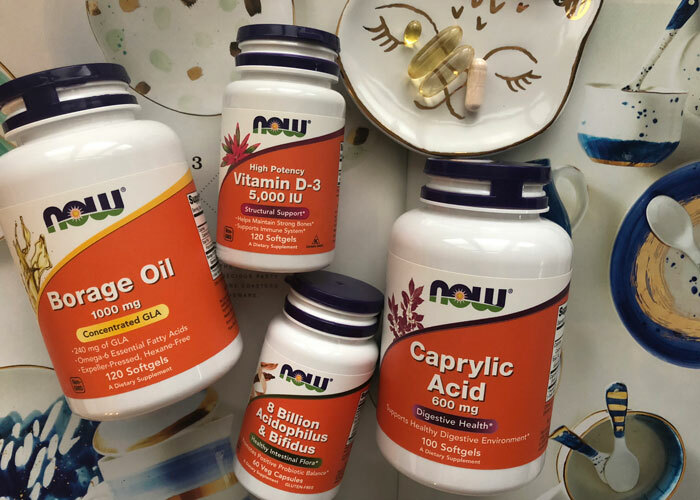 These are the supplements that I consistently take as part of my total beauty routine. Friendly reminder: The information provided in this post and on this entire website is intended for your general knowledge and inspiration only and is NOT a substitute for professional medical advice or treatment for specific medical conditions. You should NOT use this information to diagnose or treat a health problem or disease without consulting with a qualified healthcare provider. Please consult your healthcare provider with any questions or concerns you may have regarding your condition. Known for its ability to support cardiovascular health, fish oil is one of those supplements that also has beauty benefits. * The fatty acids in fish oil contribute to the overall health of our skin, providing them the omega-3’s they need to function at their best. * For vegans or those who aren’t into that fishy taste that some supps have, explore other essential fatty acid-rich nutritional oils for support. In my quest to balance my gut, caprylic acid adds medium chain fatty acid (MCT) to the mix of good bacteria and essential fatty acids. * It’s thought to help maintain a healthy balance of gut microbes and may contribute to overall gut health. * MCT oil is one that I also like to use topically. If this seems like a lot, well, it probably is — for you. Everybody is different, with different skincare and health needs. Talk with your doctor about how to safely add supplements into your total beauty routine. Once you and your doc figure out what is best for you, get a cute pill organizer to stay on track with your daily needs. A collection of supplements won’t do you any good if you don’t actually take them! What supplements do you take to support your overall health and wellness? How long have you been taking supplements? Any tips on how to stay consistent with daily supplements? Tell me in the comments!